Obsessive-compulsive thinking is quite common; most of us experience a degree of unwanted or intrusive thoughts at some point in life. But when does this become a problem? The answer is when there is an interference with daily activities. Obsessive Compulsive Disorder, when severe, can impact people’s performances at work, and waste hours of time. It is difficult to identify the underlying reasons for this disorder, but it is important to make an effort understand its causes, as this could help to find the most appropriate solution. It is believed that possible causes for Obsessive Compulsive Disorder are genetics, environment, a history of psychiatric disorders, and emotional trauma. Through scanning processes, scientists have noticed that the brain of people with OCD looks different. The difference could be the result of a low Brain-Derived Neurotropic Factor (BDNF); a very important protein that stimulates the production of new brain cells and makes existing ones stronger. It could also be caused by the detection of a high level of the stress hormone cortisol, or the presence of other chemical imbalances. The good news is that these imbalances in the brain can be addressed, if not solved. Apart from working on proper sleep, stress management, exercise, and spending more time in nature, among the current treatments for OCD are pharmaceuticals, cognitive behaviour therapy, or a combination of the two. However, drugs may have side effects. There are a surprising number of supplements that can assist with various neurological mechanisms, such as balancing brain chemicals or reducing inflammation. These supplements can be an alternative to prescription drugs. They appear to cause less side effects and interactions compared to drugs. Ashwagandha is one of the best natural treatments for OCD, as it intervenes in several mechanisms. It balances the brain chemistry, improves resilience to stress, and stimulates BDNF. This Ayurvedic herb is beneficial in reducing compulsive urges, which increase during the manifestation of anxiety and/or stress. Positive reports about its benefits are at this stage, anecdotal. In fact, no clinical research has been done. However, scientists have some explanations on why people may feel better after taking this herb. Ashwagandha contains bio-chemicals called withanolides, which are precursors to some of our hormones. When the withanolides attach themselves to hormone receptor sites in our body, the hormones that normally park there and excite the nervous system have nowhere to sit, rendering the hormone ineffective. It is theorised that Ashwagandha may help our brain’s neurotransmitter GABA do its job, which is suppressing over-excited brain activities. GABA does much of its work in the basal ganglia, the part of our brain that manages reward, voluntary control, and motivation. People with OCD are thought to have abnormal activity in the basal ganglia. 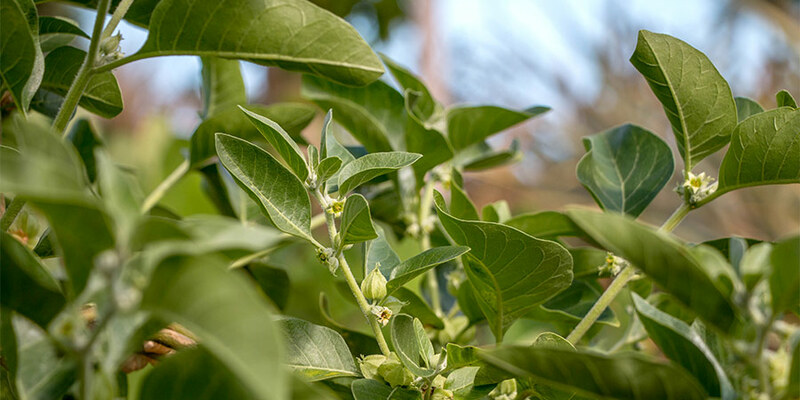 Ashwagandha is an ‘adaptogen’ herb, meaning that it can be used to manage stress, and it has been used this way for thousands of years, as it reduces the hormone cortisol. According to some studies, Ashwagandha helps to regenerate axons and dendrites, which are specialised projections that allow communication between neurons. It may also help to reconstruct synapses, the connecting points between parts of the brain. Ashwagandha may repair damaged neural networks. Ashwagandha carries out some of this magic in the brain by stimulating levels of BDNF. Also, research shows that Ashwagandha can inhibit the decline of BDNF levels in the brain. So next time you feel trapped in your head, get up and make a cup of Ashwagandha tea.